What’s the craziest harmonica in the world? 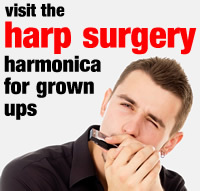 Regular visitors to the Harp Academy QI pages will know we feature all kinds of unique and whacky harmonicas. Here’s our friend Dave ‘Madcat’ Ruth demonstrating some of the things he can do with a harp. This has to be the wackiest, craziest harmonica playing in the whole world ever!